Middy is a very simple middleware engine. If you are used to web frameworks like express, than you will be familiar with the concepts adopted in Middy and you will be able to get started very quickly. Middy has been built to work by default from Node >= 6.10. If you need to run it in earlier versions of Node (eg. 4.3) then you will have to transpile middy’s code yourself using babel or a similar tool. One of the main strengths of serverless and AWS Lambda is that, from a developer perspective, your focus is mostly shifted toward implementing business logic. Anyway, when you are writing a handler, you still have to deal with some common technical concerns outside business logic, like input parsing and validation, output serialization, error handling, etc. Very often, all this necessary code ends up polluting the pure business logic code in your handlers, making the code harder to read and to maintain. In other contexts, like generic web frameworks (express, fastify, hapi, etc. ), this problem has been solved using the middleware pattern. This pattern allows developers to isolate these common technical concerns into “steps” that decorate the main business logic code. Middleware functions are generally written as independent modules and then plugged in into the application in a configuration step, thus not polluting the main business logic code that remains clean, readable and easy to maintain. Since we couldn’t find a similar approach for AWS Lambda handlers, we decided to create middy, our own middleware framework for serverless in AWS land. Write your Lambda handlers as usual, focusing mostly on implementing the bare business logic for them. Wrap your handler in the middy() factory function. This will return a new enhanced instance of your original handler, to which you will be able to attach the middlewares you need. You can also attach inline middlewares by using the functions .before, .after and .onError. For a more detailed use case and examples check the Writing a middleware section and the API section. Middy implements the classic onion-like middleware pattern, with some peculiar details. When you attach a new middleware this will wrap the business logic contained in the handler in two separate steps. When another middleware is attached this will wrap the handler again and it will be wrapped by all the previously added middlewares in order, creating multiple layers for interacting with the request (event) and the response. This way the request-response cycle flows through all the middlewares, the handler and all the middlewares again, giving the opportunity within every step to modify or enrich the current request, context or the response. Middlewares have two phases: before and after. The before phase, happens before the handler is executed. In this code the response is not created yet, so you will have access only to the request. 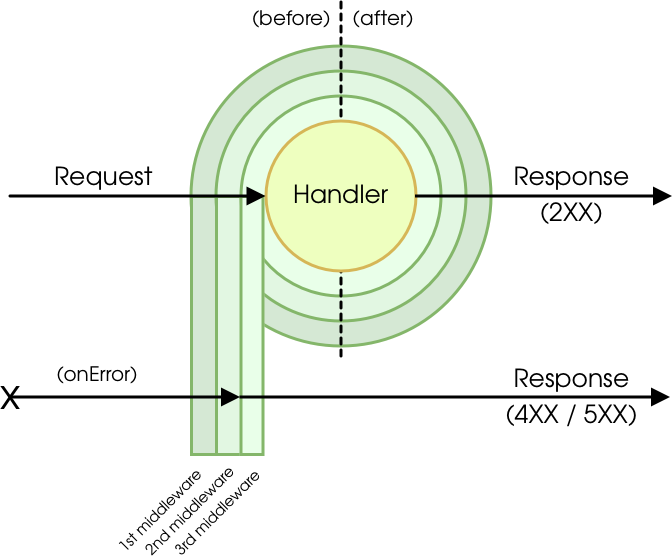 The after phase, happens after the handler is executed. In this code you will have access to both the request and the response. Notice that in the after phase, middlewares are executed in inverted order, this way the first handler attached is the one with the highest priority as it will be the first able to change the request and last able to modify the response before it gets sent to the user. Some middlewares might need to stop the whole execution flow and return a response immediately. If you want to do this you can invoke handler.callback in your middleware and return early without invoking next. Note: this will totally stop the execution of successive middlewares in any phase (before and after) and returns an early response (or an error) directly at the Lambda level. If your middlewares do a specific task on every request like output serialization or error handling, these won’t be invoked in this case. But what happens when there is an error? When there is an error, the regular control flow is stopped and the execution is moved back to all the middlewares that implements a special phase called onError, following the order they have been attached. Every onError middleware can decide to handle the error and create a proper response or to delegate the error to the next middleware. When a middleware handles the error and creates a response, the execution is still propagated to all the other error middlewares and they have a chance to update or replace the response as needed. At the end of the error middlewares sequence, the response is returned to the user. If no middleware manages the error, the Lambda execution fails reporting the unmanaged error. Middy allows you to return promises (or throw errors) from your handlers (instead of calling callback()) and middlewares (instead of calling next()). Node.js 8.10 supports async/await, allowing you to work with promises in a way that makes handling asynchronous logic easier to reason about and asynchronous code easier to read. You can still use async/await if you’re running AWS Lambda on Node.js 6.10, but you will need to transpile your async/await code (e.g. using babel). handler: is a reference to the current context and it allows access to (and modification of) the current event (request), the response (in the after phase) and error (in case of an error). In order to make middlewares configurable they are generally exported as a function that accepts a configuration object. This function should then return the middleware object with before, after and onError as keys. Sometimes you want to create handlers that serve a very small need and that are not necessarily re-usable. In such cases you probably will need to hook only into one of the different phases (before, after or onError). In these cases you can use inline middlewares which are shortcut functions to hook logic into Middy’s control flow. As you can see above, a middy instance also exposes the before, after and onError methods to allow you to quickly hook-in simple inline middlewares. Check the code for existing middlewares to see more examples on how to write a middleware. functionShield: Hardens AWS Lambda execution environment Note: functionShield has been removed from core since 0.22.0. Use @middy/function-shield instead. httpErrorHandler: Creates a proper HTTP response for errors that are created with the http-errors module and represents proper HTTP errors. httpEventNormalizer: Normalizes HTTP events by adding an empty object for queryStringParameters and pathParameters if they are missing. httpHeaderNormalizer: Normalizes HTTP header names to their canonical format. httpMultipartBodyParser: Automatically parses HTTP requests with content type multipart/form-data. httpPartialResponse: Filter response objects attributes based on query string parameters. jsonBodyParser: Automatically parses HTTP requests with JSON body and converts the body into an object. Also handles gracefully broken JSON if used in combination of httpErrorHandler. s3KeyNormalizer: Normalizes key names in s3 events. secretsManager: Fetches parameters from AWS Secrets Manager. ssm: Fetches parameters from AWS Systems Manager Parameter Store. urlEncodeBodyParser: Automatically parses HTTP requests with URL encoded body (typically the result of a form submit). Middy factory function. Use it to wrap your existing handler to enable middlewares on it. Returns: void | Promise - - A middleware can return a Promise instead of using the next function as a callback. In this case middy will wait for the promise to resolve (or reject) and it will automatically propagate the result to the next middleware. After that you can import middy from 'middy'; in your http handler and use it as described above. Everyone is very welcome to contribute to this repository. Feel free to raise issues or to submit Pull Requests. Licensed under MIT License. Copyright (c) 2017-2018 Luciano Mammino and the Middy team. middy is maintained by middyjs. This page was generated by GitHub Pages.